The Society’s new season of talks begins on Thursday 11th September at 7:30 pm in St. Andrew’s Church, Bilston Street, Sedgley. The speaker is Kate Hartland-Westwood with her award-winning presentation on coffee mill makers. Kate won the 2014 Wolverhampton Local History Symposium with her talk covering the period 1760 to 1911. Manufacture thrived in the town producing mills for use in homes and shops. By the 1850s nearly 150 businesses existed. An original coffee mill will be on display. The talk is very apt for the Society with Census returns in Sedgley showing several coffee mill makers. It is assumed complete mills were made in the village. As usual visitors are invited to come along. Individual talks cost £1. Annual membership of the Society costs £5 and gives free access to the programme of talks. 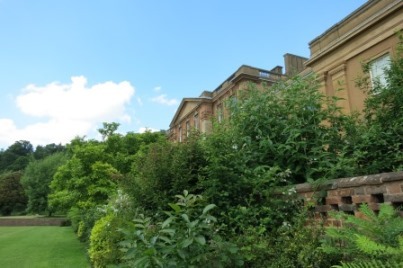 Stretch your legs in the grounds of Himley Hall, then pop indoors to see two cracking exhibitions. Artist Geoff Tristram describes himself as ‘artist, cartoonist and comedy writer’. This exhibition features every aspect of his work – from cats and classic portraits to politicians and snooker players. It is impossible to leave the room without a big smile on your face – the cartoons for Ravensburger puzzles are a hoot and the books are hilarious. The show is titled Forty years watching paint dry! Enjoy. Next door The Earl of Dudley Estate: Eight Centuries of History showcases archive material from the Earl of Dudley Estate Collection which has recently been fully catalogued with the aid of a national grant. Of particular interest is the development of the Himley site from moated manor house to today’s Palladian style mansion. Still looking for more treats? If so, browse Discover Dudley. The Society’s latest occasional news-sheet covers local flags and workhouses.